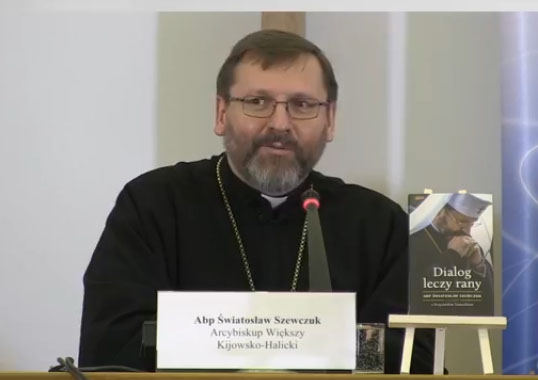 On March 15, 2018 in Warsaw, the Father and Head of the Ukrainian Greek Catholic Church, His Beatitude Sviatoslav presented a book-interview "A Dialogue Heals Wounds. About God, Church and World." The presentation was held at the press center of the Bishops' Conference of Poland (Card. Stefan Vyshynsky St., 6). In the event participated: the Primate of the UGCC His Beatitude Sviatoslav, Cardinal Kazimierz Nich, Bishop Arthur Mizinsky, editor Krzysztof Thomasik. The book was published in early 2018 at the publishing house "Znak" in Krakow on the 1030th anniversary of the Baptism of Kyivan Rus’. It should be noted that in the edition "A Dialogue Heals Wounds. About God, Church and World" His Beatitude Sviatoslav in an extensive interview with the editor of the Catholic News Agency Krzysztof Thomasik opens some still unknown facts about the past and present-day UGCC, as well as his own way of life and ministry. The conversation took place in Zakopane near Krakow before the pilgrimage onto Mount Javir and Lemkovite Vatra on July 21-23, 2017. His Beatitude Sviatoslav, the Father and Head of the Ukrainian Greek Catholic Church, as well as a musician, physician and friend of Pope Francis, for the first time, comprehensively and sincerely tells about the largest Eastern Catholic Church in the world and much more. He sincerely and directly represents his way of life and ministry and reveals his own vision of God, the Church and the world. He speaks a lot about the threats posed by extreme nationalism and about the chances that a dialogue can create, as well as about the good, though sometimes painful relations with Poland, Russia and the Orthodox Church, and about everything that hinders the full cooperation between Eastern and Western Catholics. In the book, we will find the testimony of His Beatitude Svyatoslav about St. John Paul II, who made a tremendous contribution to the revival of the Ukrainian Greek Catholic Church - the Church of Martyrs; who supported the revival of Ukraine and welcomed its sovereignty. In addition, he made an indisputable contribution to the Polish-Ukrainian reconciliation process by implementing a number of initiatives in this sphere. One of them was the meeting of Ukrainian and Polish bishops in Rome in October 1987, where a joint declaration on the forgiveness and reconciliation between the Poles and Ukrainians was signed. On the occasion of the 30th anniversary of this event, on October 11, 2017, His Beatitude Sviatoslav proclaimed St. John Paul II the patron saint of the "holy cause of Polish-Ukrainian reconciliation" at the Basilica of St. Peter in Rome. First of all, His Beatitude Sviatoslav in an interview with the editor of the Catholic News Agency, Krzysztof Tomasik, says that we, as the faithful of one Ecumenical Church, must know about each other.